A no-fuss option to firmly taking control of a rodent problem. 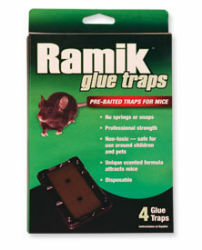 All you need to do is place the ready-to-use glue traps and boards along rodent runways, and Ramik’s combination of special attractants and powerful adhesive does the rest. Disposable, non-toxic, ready-to-use, professional strength pre-baited trap.